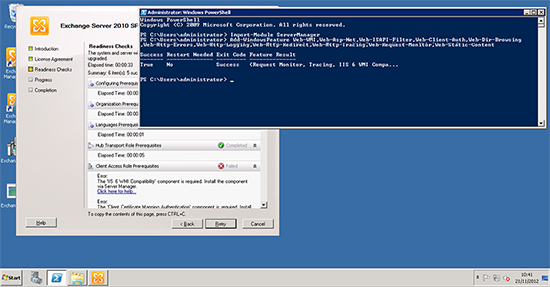 The 'IIS 6 WMI Compatibility' component is required. Install the component via Server Manager. The 'Client Certificate Mapping Authentication' component is required. Install the component via Server Manager. The 'Directory Browsing' component is required. Install the component via Server Manager. The 'HTTP Errors' component is required. Install the component via Server Manager. The 'HTTP Logging' component is required. Install the component via Server Manager. The 'HTTP Redirection' component is required. Install the component via Server Manager. The 'Tracing' component is required. 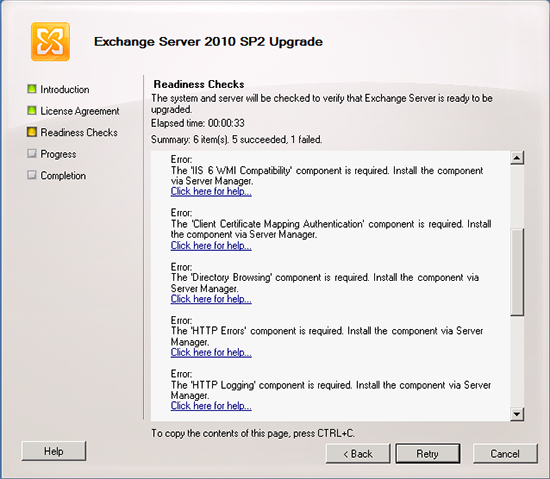 Install the component via Server Manager. The 'Request Monitor' component is required. Install the component via Server Manager. The 'Static Content' component is required. Install the component via Server Manager. There are simply more server roles now required for an Exchange Server that has the Client Access Server role. I prefer to do things myself, so you can add all the roles from PowerShell. 3. Then re-run the SP2 setup.